The beautiful designRITE instrument has been recognised with international design awards, reflecting the combination of great sound quality with ergonomic and beautiful design for comfortable wearing. A hearing aid is an electroacoustic medical device designed to amplify ambient sound to compensate for the auditory deficiency of the wearer. These devices consist of four main parts. - A microphone picks up sound from the surroundings. - An amplifier with a bandpass filter amplifies useful frequencies while eliminating those likely to interfere with the useful waves. 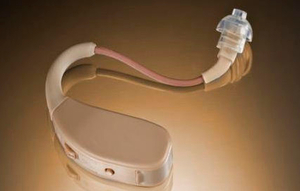 - Controls, sometimes in the form of a remote unit, allow the wearer and the audiologist to adjust the device. - A speaker delivers the amplified and filtered sounds to the wearer ear. Hearing aids differ in power, the frequencies they amplify and their configuration and placement. There are in-the-ear, behind-the-ear, in-the-canal and other models. They model chosen must be suitable for the individual wearer, adult or child.